Proper safety gear is an absolute must when you perform welding tasks. After all, the craft of welding involves a wide range of tasks and safety hazards, with burns being the most common hazard. You deal with numerous dangerous elements and things when welding such as heat, flying metal fragments, and sparks. The dangerous elements and things can be detrimental to your health and well-being. The hands, in particular, must be well-protected because of their close proximity to the welding torch and welding materials. You must spare no expense in acquiring the best welding glove. So, the question arises—how do you choose the best welding gloves? When selecting gloves, we would recommend you pay attention to three primary factors and they are performance, protection, and price. We highly believe that the Caiman 1878-5 21-Inch is the best welding gloves for all types of welding whether it is for TIG, MIG, or stick. 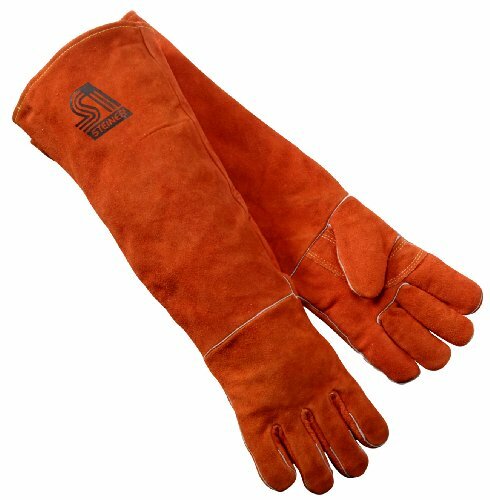 The 21-inch deerskin welding glove is specifically designed to match the natural shape of the human hand and truly does fit like a glove. It provides proper finger alignment, dexterity, comfort, and protection all the way up to the forearm. The pieces of leather on the glove are all stitched with 100% Kevlar thread. We also love the fact that the manufacturers of this product have added a leather patch along the wrist for extra protection. 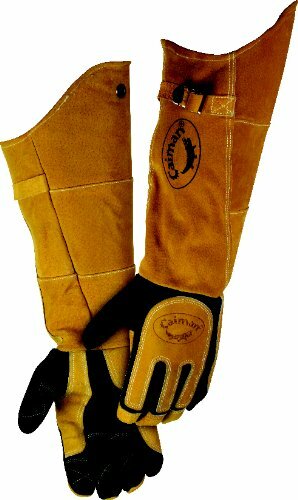 The Caiman 1878-5 21-Inch has all the features one would expect in a high-quality welding glove. We simply can´t stop waxing lyrical about this product. Conforms to the natural shape of the human hand, extra padding and reinforcements for added safety, Sewn with Kevlar thread. Not suitable for work that requires small, precise movements and can get hot and sweaty in high temperatures, doesn´t fit extra-large hands. The Lincoln Electric K3109-M takes the second spot on our list and it is there for a reason. Manufactured by the brand, Lincoln, that is one of the leading welding glove manufacturers in the world, the Lincoln Electric K3109-M has been stylishly designed to look more like motorcycle gloves than welding gloves. Constructed of pure cow leather, the glove is stitched with Kevlar threading. Therefore, you can be assured of its durability and reliability. However, the feature that surprised us the most was undoubtedly the Silicon placed under the knuckles. The Silicon ensures that your hand remains firmly protected even in the harshest of environments. Regrettably, it misses out on our top spot because of its size, or rather lack of it. Measuring only about 12.1 inches from the finger-tip to collar, this glove doesn´t provide complete protection. You´d have to splurge on welding sleeves as well. Made of pure cow leather for heat resistance, sewn with Kevlar thread, Silicon padding for extra safety. Small length, the fitting can be rather tight in the beginning, much more expensive than your average glove. Few would argue with the inclusion of the Lincoln Electric K2979-ALL on our list. It is one of the best value for money welding gloves available for purchase. Constructed of split cowhide leather, the glove serves as the perfect companion during heavy-duty welding work. We also like the fact that it features full sock lining for comfort. In addition to that, the glove is stitched with Kevlar threading; you can bet your bottom dollar that it excels in the durability department. The manufacturers of this particular glove have also smartly incorporated additional thumb pad in the high wear areas for increased glove lifespan. 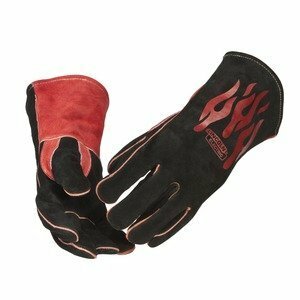 Heat and flame resistant, sewn with Kevlar thread, additional thumb pad for durability. Fingers are all the same size; lacks dexterity, the size may not be appropriate for some users. The Steiner 21923 isn´t really a special welding glove by any stretch of the imagination, but it does have its fair share of features. What really sets this product apart from the rest is its length. The glove measures a whopping 23-inches that may not necessarily be well-received by everyone. However, there are ardent fans of larger gloves and we do have to consider that as well. The glove can provide overall arm protection and is especially useful during overhead welding. Constructed of shoulder split cowhide leather, the glove is well-capable of providing proper heat protection. We also love the fact that the back of the glove is completely insulated for extra protection. For a glove that is pretty large, it weighs a mere 1.1 lbs., making it one of the lightest gloves out there. 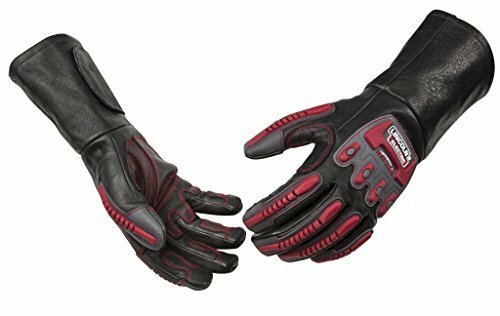 Large and light-weight, constructed of split cowhide leather for proper heat protection, overall arm protection, the thumb contains extra padding and the back of the glove is double insulated. Not the best stitching quality, has a tendency to shrink when used under high temperature, too thick. It is rather unfortunate that we don´t have plenty of nice things to say about this welding glove. The TILLMAN-25BL- Large takes the last spot on our list because it simply doesn´t work as advertised. This particular glove has some type of fuzz all over it that tends to shed everywhere. In addition to that, it also doesn´t help that the glove is pretty thin. The only good thing about this particular glove is the fact that it is lightweight. Besides that, it doesn´t offer anything else and is, therefore, not worth the investment. Has some type of fuzz all over it that sheds everywhere, not thick enough for heavy-duty work. You should be well aware that not all gloves are created the same. To be precise, each type of welding process requires a specific type of glove suitable for the job. It is also equally important for you to understand how much protection you need. The more heat you are exposed to through your process, the more insulation you´ll need. There are also processes that require more precise control. Hence, instead of just paying attention to the glove´s resistant to heat, flame, and abrasion, you may also need to identify if it allows more finger mobility. During stick welding, you are exposed to high temperatures and high heat. Hence, it is essential for you to protect yourself with stiff, heavy-duty gloves that are capable of withstanding high temperatures. The general rule of thumb implies that you should get a glove constructed of either top-grain pigskin, goatskin, or elk skin when involved in stick welding processes. There are various types of welding processes that beg for special features. For example, there are MIG welding gloves that have a thick pad at the back of the hand. The thick pad does an exceptional job of protecting the hand during a typical position where the non-dominant hand is used to stabilize the welding torch. Unlike other types of gloves, MIG welding gloves commonly fit loosely and are easy to take off. The fingers are more rigid too. If you want to get yourself a MIG welding glove, we would recommend you get one that is either constructed of top-grain cowhide, deerskin, or goatskin. Unlike other types of gloves, the TIG welding gloves are commonly constructed of softer, thinner leather. They usually boast of a fire-resistant fabric. During TIG welding processes, both the palms directly face the welding tool; hence, there is no need for a thick pad at the back of the gloves. Since TIG welding processes require more precise control, TIG welding gloves fit well and allow more finger mobility. When performing TIG welding, you don´t get exposed to a high temperature or high heat. The job requires you to wear gloves that allow precise movement for precise welds with the TIG torch. TIG welding begs for a glove that is not only light but also flexible. When selecting a TIG welding glove, we would recommend you go for a glove that is constructed of deerskin. What makes deerskin gloves so good is the fact that they tend to shape themselves to a welder´s hand over time, providing an extremely comfortable fit. It is not necessary for you to spend a fortune to acquire a welding glove. With that being said, you should also understand that you get what you pay for and that you should spare no expense in acquiring a high-quality welding glove for your safety. You should understand that you will only be able to make an informed purchase if you understand your welding needs and requirements. However, if you don´t have the time to conduct your research, and would rather prefer us to direct you to a few models, you have come to the right place. Without straying away from the topic any further, here are our top picks. You can trust our judgment and opt to purchase one of the many welding gloves we have mentioned below if you don´t have the time to conduct your own research. It is imperative for you to protect your entire body when welding due to the dangerous nature of the craft. The hands, in particular, must be well-protected because of their close proximity to the welding torch. You must spare no expense in acquiring the best welding glove. And, we would suggest you take our recommendations seriously and go for the Caiman 1878-5 21-Inch. 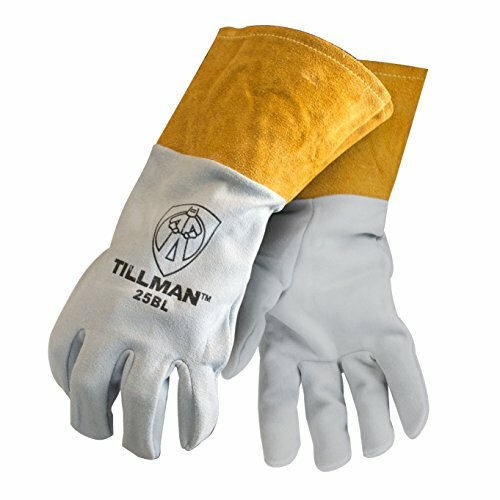 The deerskin welding glove is specifically designed to match the natural shape of the human hand, providing proper finger alignment, dexterity, comfort, and protection all the way up to the forearm. However, if you are one who likes acquiring products that are bang for the buck, we would recommend the Lincoln Electric K2979-ALL.